June Special! $200 off! Walk to the Ocean & Nearby Scarborough Beach! This quiet home is a short walk to Scarborough Beach and scenic Black Point. With its large back yard and raised deck it is the perfect place to entertain friends and family. Only a 5 minute walk to Black Point, there is a short trail through a wooded area that leads to a picturesque portion of the coast. Perfect for picnics, a hike or perhaps a little fishing! There are majestic views of the bay and stunning vistas of the Atlantic Ocean. Wander the huge granite boulders and explore the tide pools. Additionally, a walking path from Blackpoint leads you to the picture perfect waters of Scarborough beach ( less than a mile away!). A quick bike ride down Ocean Road has you at the front doors of several stately mansions owned by celebrities. Save some energy for grilling at sunset or head down to Pt. Judith for some of the best seafood in America! We have a minimum rental stay of 3 nights, with move in dates being each Saturday, and move out day traditionally being the following Saturday. This is duplex. The two homes are completely separated and private from the other. entrances, yards, decks, driveways,outdoor showers are private and secluded . The home was designed with sound and privacy in mind. Blocks from great fishing and hiking at Black Point. Also only a 12 minute walk to Scarborough Beach! Outdoor shower (hot and cold water) and changing room, spacious back yard, walk to the beach in minutes. We are a family of 5, this house fit us great with one of the kids on an air mattress. The Air Conditioner is upstairs on the living level w/ a dehumidifier down on the bedroom level. As someone who prefers life at 68 degrees, this was totally fine w/ a few fans and day time temps inland in the 90s (I guess my point is, this isn't central AC and each room does not have a window unit but that's fine). 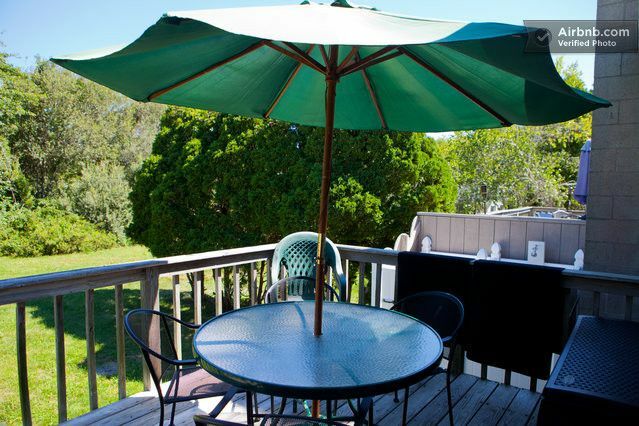 Walking distance to beach (we drove every time though, it would be a 10 minute walk max), very short drive to Narraganset Pier, short ride to Galilee, very quiet neighborhood, all of the appliances worked, having a washer and dryer was a huge help. This is a duplex - as we moved in our adjoining neighbor moved in with a baby, we were pretty sure we would hear the baby crying at some point. However, had we not seen their car pull in and out occasionally, we would have not known anyone was on the other side. The house (and neighborhood) is very, very quiet. John was a great guess!!! We hope to accommodate them next year. We were happy to see that the kitchen and bathroom were new and in good condition but the living room was terrible to relax in it had one small couch (which is not the pic it shows online) and two hard little chairs, the bedrooms smelled moldy and so did the dressers and closet, I had to wash all my clothes over when I got home. There was a little closet that housed the washer and dryer which were leaking and they had a dehumidifier in there which was pouring out hot air. One bedroom had a really nice mattress (new) but the other two bedrooms had uncomfortable mattresses, the refrigerator was leaking badly so we had to keep a towel in front on floor at all times. I called the office twice to report it they said someone would get back to me but never did. Plus everything the other review said about the floors in bedrooms etc. I wouldn't stay there again! This house pretty much had everything we needed for the week. There are however some suggestions that I would make for improvements. The bed mattresses could use an up date and the downstairs laminate floor was obviously not installed correctly. There is some significant warping of the various pieces. This could be easily repaired. The lack of air conditioning could be a factor during very hot weather. Finally, some documentation regarding how the TV works (cable channels are pretty limited, how to sign on to the Wi-fi, when garbage is picked up, what to do with reyclables, and where to find things would be helpful. In other places we've rented, a log is available for visitors to share heir experiences. We found that to be really helpful. In any case, none of these issues woud necessarily discourage us from re-visiting. We were able to comfortably sleep 6 and the kitchen was well-resourced. We loved being close to Black Point and within a mile of Scarborough Beach. Just 3 blocks away from the iconic Black Point, with its gorgeous ocean views. The perfect place for a picnic, a hike or maybe a little fishing! If you are in more of a beachy mood, there is an ocean side trail from Black Point to the foot of Scarborough beach! ( A 15 minute walk) Truly a local hidden gem.